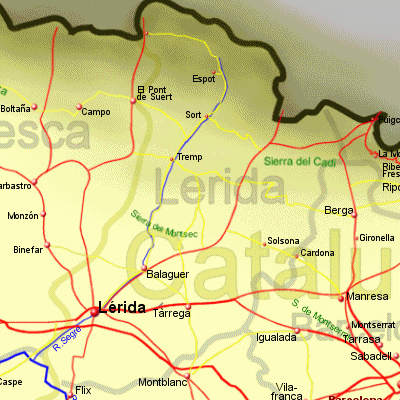 Lérida, known as Lleida in Catalan, is the most westerly of the Catalan provinces and is without a coastline. However it is a diverse and fascinating province, starting from just north of the River Ebro, north through cereal growing areas, and into the Pyrenees (where it borders France). Here you will at first find an attractive rolling landscape, then more dramatic and stunning scenery with narrow gorges, fast flowing rivers, lakes, and for a surprising amount of the year, snow topped mountains. The mountains and foothills of the Pyrenees provide a great outdoor playground offering, skiing or snowboarding (11 ski stations), walking, riding, white water rafting, kayaking, and climbing. For those that enjoy fantastic scenery and pure nature, the Aiguestortes and Estany de Sant Maurici National Park, with its masses of high mountain lakes, would take some beating. If travelling by car, there are many routes to explore, but you can also travel by train. Lérida city has rail connections, including the High Speed AVE from Barcelona or Madrid. From Lérida there is a train service (occasionally powered by steam) running north as far as La Poble de Segur in the Pre-Pyrenees, passing stunning scenary on it's way, as it follows the Rio Segre through gorges and past reserviors.